By Krista Baliko Posted: October 23, 2017 6:00 a.m.
Graphic novels by First Nations creators, mental health and wellness among Indigenous populations and a book launch about the Regina Indian Industrial School are among the many topics up for discussion during the University of Regina’s Indigenous Research Day, taking place on the evening of Wednesday, October 25 and all day on Thursday, October 26. A big find in an old cardboard box is another. “In fall 2016, while searching for a book in the basement of First Nations University of Canada, I stumbled upon a dusty box full of binders that were filled with hundreds of black and white photos,” says Dr. Andrew Miller. 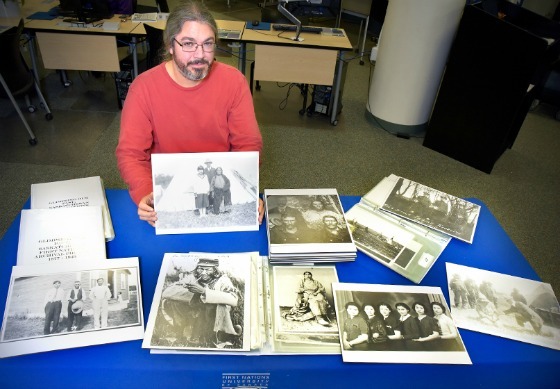 Miller, associate professor of Indigenous Studies at First Nations University of Canada, had discovered a collection of 589 archival photos of Saskatchewan First Nations and Métis peoples, dated between 1873 and 1979. He later learned the pictures are copies of negatives housed at the Provincial Archives of Saskatchewan. 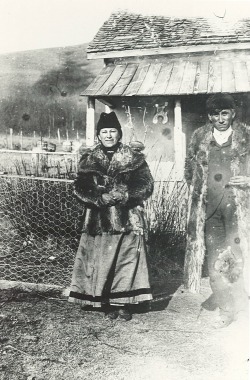 A photo from the collection, with "Louis and Martha Tawiyaka in front of A. Rooke's house, 'Crowsnest' near Fort Qu'Apelle; married 1897," written on the back. Provincial Archives of Saskatchewan: RB-1783, 1898. “These photos are absolutely gorgeous. They are little windows into a past that many of us aren’t familiar with,” Miller says. Since finding the photos, Miller has worked closely with different First Nations communities so they have the chance to describe the individuals and histories presented in the pictures in their own voices. In the coming months, the collection will also be available online, allowing more people the opportunity to see and comment on them. One story Miller heard came from Wayne Goodwill, an elder from Standing Buffalo First Nation who recognized his great-grandmother in a photo from 1898. Dr. David Malloy, Vice-President (Research), says Indigenous-centred scholarship is fundamental to the University. Indigenous Research Day activities kick off on Wednesday evening with a screening of RIIS from Amnesia, a film about the Regina Indian Industrial School cemetery, directed by Saskatchewan filmmakers Janine Windolph and Trudy Stewart. The film will be followed by the launch of a book by Dr. Douglas Stewart, professor emeritus in the Faculty of Education, entitled, The Regina Indian Industrial School (1891-1910): Historical Overview and Chronological Narrative. On Thursday, Miller will present his project called, “Glimpsing the Past: Visual Repatriation of Saskatchewan First Nations Photographic Archive,” along with more than 20 other scholars who will present Indigenous-centred research. Members of the community are invited to take part in all Indigenous Research Day activities. Presentations run 45 minutes, begin at 9:30 a.m. and run throughout the day until 3:30 p.m.
For more detailed information about these events, check out the Indigenous Research Day schedule of events. www.uregina.ca/research/indigenous-research-day.html.